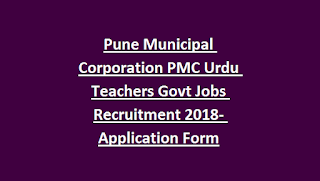 PMC Urdu Teachers Jobs Recruitment 2018: Pune Municipal Corporation released a new vacancy notification for the recruitment of Urdu Teachers jobs in Urdu Medium Schools which are running under PMC. 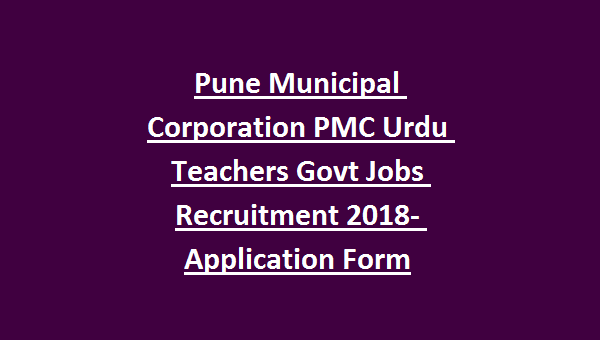 There are total 41 Urdu Teachers jobs in Pune Municipal Corporation recruitment 2018. Those who are qualified D.Ed with TET they are only eligible for this PMC Urdu Teachers jobs. Candidates can submit their application form with 7 days from the notification given in official website. Probable last date to submission of application form to PMC Education Department is 27-11-2018. Candidates must have studied Urdu Medium. Candidate’s selection will be based on merit in qualifications for this PMC Urdu Teachers jobs recruitment 2018. Detailed information is given below for this PMC Urdu Teachers recruitment 2018. Within 7 days from the notification given date. There are total 41 Urdu Teachers Jobs in PMC recruitment 2018. Upper age limit is 38 years for open category candidates and for other upper age limit is 43 years. 12th class, D.Ed with TET qualification is required. Selection will be based on merit in educational qualifications for this PMC recruitment 2018. Total recruitment will be held for 50 marks. Submit the application form in a prescribed format for this PMC Urdu Teachers Jobs recruitment 2018 with 7 days from the notification given in www.pmc.gov.in.